Austin and I dated for 2 month, were engaged for 2 months, got married for $1000, and are coming up on our 8 year anniversary! Our super-frugal wedding was exactly what I wanted it to be: Simple. You’re so surprised, right? I didn’t want to plan for a year and spend tens of thousands of dollars on a single day of my life. We did some very important (though quite unconventional) things to save money on our wedding day. If you, or someone you know, is trying to save some money on their wedding, you’ll be able to apply some of the ideas below. When we got married, my parents told us they were giving us $4000 to use however we wanted. We could use it all on our wedding or do anything else with it. At the time, I didn’t have a job and Austin was about to start a temp job in a warehouse. We had a small amount of debt and no extra money. We needed that $4000 to do a lot, like pay for our wedding, honeymoon, and help pay off some debt. I already knew I wanted a small, simple wedding and it turned into a fun challenge to see how inexpensively we could do it! 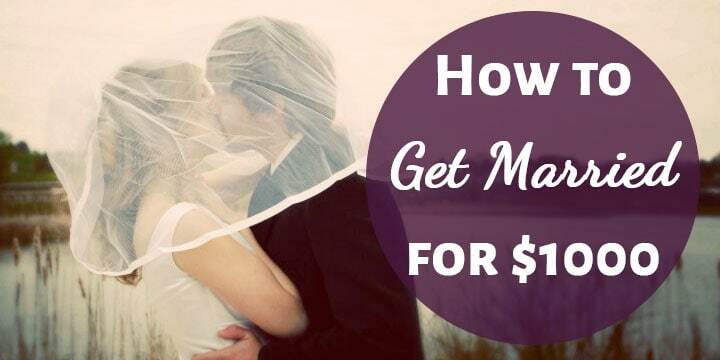 This is the #1 way to save money on a wedding. Unfortunately, it’s also the hardest for most people to deal with. Keep your guest list extra-small. Extra people means that you need a larger venue, more chairs and tables, and extra meals. Every extra person makes your wedding more expensive! 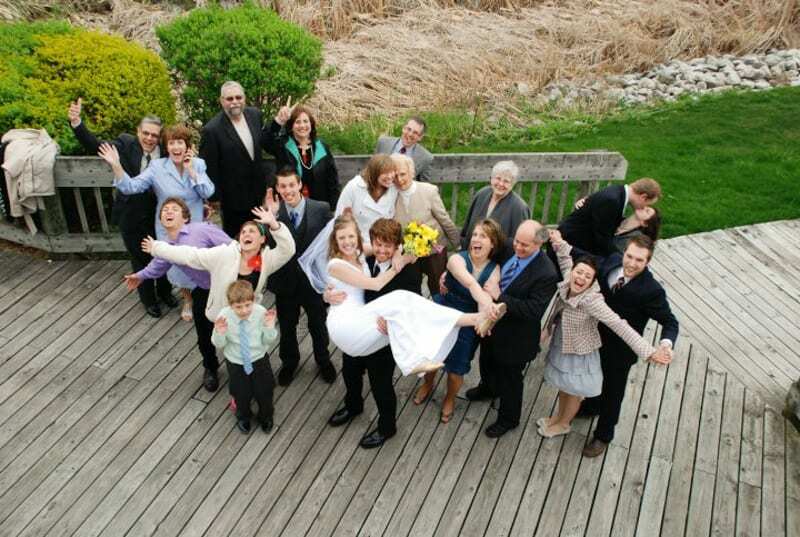 We had a grand total of 20 people at our wedding. It was only immediate family members, two of our grandparents, and a couple of extra people. That’s it. It actually seemed a lot easier to have a super tiny wedding than just a small wedding. When you keep things so small, it’s easier to make decisions because almost no-one is invited, hahaha. There was no, “well, if I invite this friend, then I need to invite this friend” and “if all the aunts and uncles come, then we need to invite all of the cousins and great aunts and uncles” and no coworkers/kind-of friends… It was simple. We had our parents and siblings there, plus just a couple of other people close to us. Keeping things extra-tiny also meant that people weren’t really offended to be left out because they knew that it was essentially immediate family only. I know most people want a lot of people at their wedding, but it was really special for us to be surrounded by our closest relatives. This decision was huge in keeping costs down, as you’ll see as you keep reading! Our venue was free! Since we only had to accommodate 20 people, we had plenty of options on where to get hitched. It did take some searching, though. I found a hotel on a lake that had walkway and gazebo out on the water. They didn’t charge for the use of it! We rented a room that we stayed in for our first night as a married couple and used it to get ready in before the ceremony. I really wanted to get married outside, which had one big cost-saving benefit: we didn’t have to decorate. Nature is beautiful. We didn’t worry about decorating at all. Most indoor weddings include a whole lot of flowers and candles and other decor. Sure, we could have done some of that, but it wasn’t necessary at all and I still think we had a beautiful wedding because of the setting. I’d recommend looking for smaller areas to get married at. Look at places that aren’t necessarily meant for weddings: gazebos, parks, beaches, or even a friend’s nicely-landscaped backyard. As you’ll read about in the next section, we only needed a place to have the ceremony because we did something unique instead of a traditional reception afterwards. We didn’t need a banquet hall or caterer. Wedding catering can be the biggest expense of all! We did something a little different to save money. Instead of paying for a banquet hall, tables and chair rentals, table cloths, and decor…. We went to a restaurant! I made reservations at a nearby restaurant for our group and we all just went out to eat after the wedding. Once again, this money-saving move was possible because we had such a small guest list. Our whole group got to sit together at one long table. We all had such a good time! Everyone ordered whatever they wanted from the menu — no fish or chicken option. I believe I had a burger and fries. The whole bill was a few hundred dollars. I know that this seriously bucks the trend of an elaborately decorated hall with food stations, catering, dancing, and everything else that goes along with the reception. But it also means I didn’t worry about decorations, seating charts, food tastings, cleaning up, down payments and security deposits. It was stress-free and fun. This might be my favorite wedding “hack” of all. I had a hard time finding a wedding dress for two reasons: (1) The prices were just insane! It would have been easy to spend our whole budget on my wedding dress and (2) I found all of the wedding dresses to be so thick and heavy. I couldn’t imagine myself comfortably enjoying my wedding day strapped into those things. As I was browsing a wedding dress website, I realized that you could order a lot of bridesmaid dresses in white *lightbulb turns on over head*. Some of the bridesmaid dresses were much more my style. They were light, simple, and much less expensive. I picked out a gorgeous satin dress and had the dress shop order it in white for me. For about $100, I got exactly what I wanted. I told this tip to a friend last summer who was having a hard time finding the right dress. She ended up ordering a bridesmaid dress in white as well! And can we all just talk about how stupid-expensive veils are? $300 for a strip of netting. 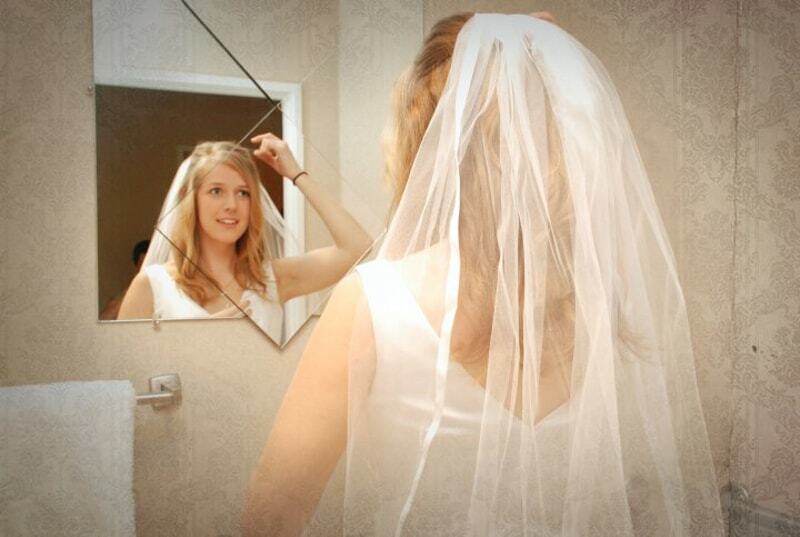 I almost skipped getting a veil, but there are not many days in your life where you get to wear a veil, right? I’m so glad that I didn’t skip it. Hobby Lobby, and I’m assuming other craft stores, sells veils in their wedding section. They had a satin-trimmed veil that perfectly matched my wedding dress for $10! We totally skipped flowers except for my bouquet. The day before the wedding, my mom and I bought a big bouquet of grocery store flowers for about $15. I wrapped ribbon around them to create my bridal bouquet. Since we didn’t have a traditions reception, we only had to worry about music for the wedding ceremony. My brother played acoustic guitar while I walked down the isle and he played a fun song on a portable speaker as we walked out at the end. Simple and free! I knew I didn’t want to skip having a good photographer. At the end of the day, besides being married, you just have photos and memories. A photographer could have also blown our budget, though. 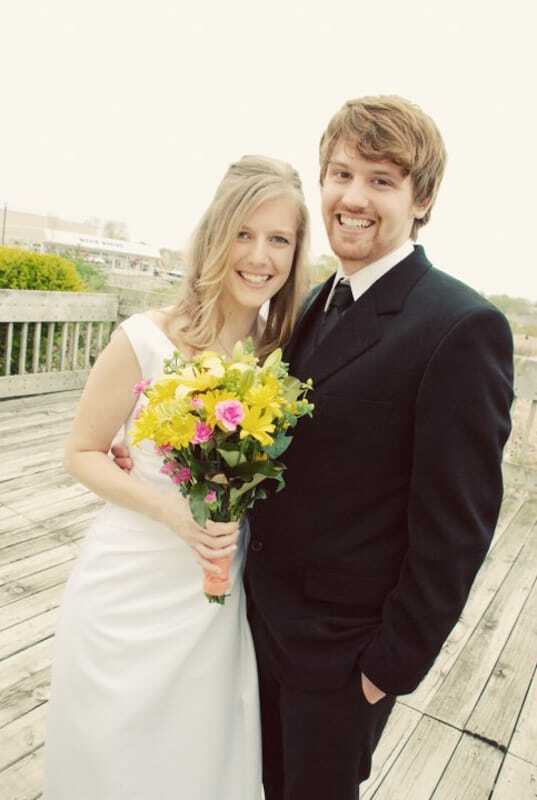 What I did was put an add on Craigslist saying that I was looking for someone to photograph our wedding. I added the date of the wedding, explained how small it was, told them it would only be for a few hours, asked how much they would charge and told them that I wanted a disc of images (I didn’t want to have to order overpriced prints through them). I also asked for examples of their work. Since our wedding was so much smaller and would require much less work for a photographer than a traditional wedding, I was able to ask people to tell me what they would charge instead of just looking at a photographer’s normal wedding package pricing. I had a few people respond with their prices and examples. We paid a few hundred dollars for a woman to take photos for us. She was trying to grow her business and had done a few weddings before. Her work was beautiful! Unless you have a real photographer in the family who will gift you their services, paying for a good photographer is worth it. If it’s someone’s cousin who happens to have a nice camera and likes to take pictures, you risk not getting good photos to remember the day with. I would look for someone who has shot weddings before and whose style of editing you like. I’m thrilled with the photos from our wedding and am so glad we didn’t skip this, even though it took a large chunk of our budget. Sometimes it’s easier to have a tiny wedding than a small wedding. Get married outside and enjoy the natural beauty instead of decorating. Skip the hall and catering — go out to a restaurant. Order a bridesmaid dress in white. Craft stores sell veils for a fraction of the cost of wedding shops. Grocery store flowers aren’t any less pretty than official wedding flowers. Put out an ad asking how much a photographer would charge for your event. You might have noticed that we totally skipped a lot of things that are normally a part of a wedding. We didn’t have any attendants, a wedding cake, or party favors. At the end of it all, we wanted to be married! It wasn’t a stressful day because we skipped a lot of the normal wedding stuff and there was so little to worry about. It was perfect! What about other family and friends? Yes, I know you’re still struggling with the tiny guest list idea. We found a work-around for this. About a month after our wedding, we threw a casual party and invited extended family and friends. 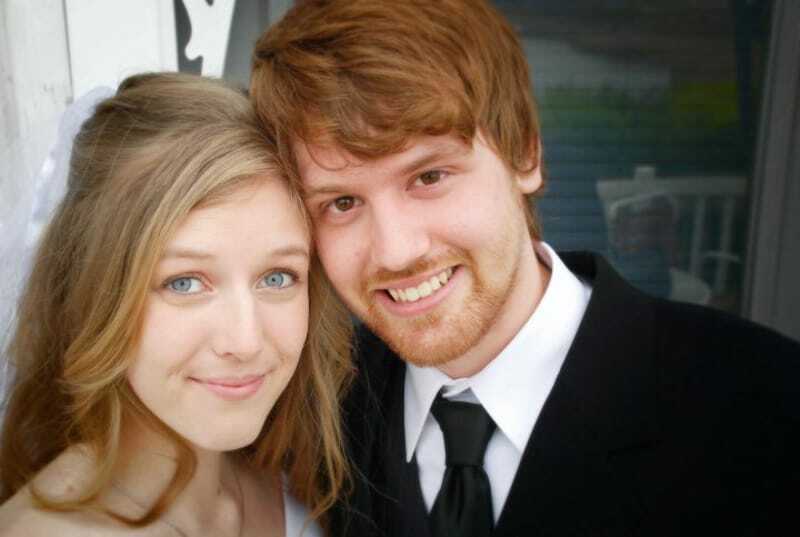 There was a slideshow playing of our wedding photos, so people could see the big day. We paid for a caterer to serve a super casual meal, buffet-style (Which I regret because of the cost. We should have just grilled burgers and hotdogs ourselves). There was a big graduation-style cake as well so we could cut the cake. The whole party was fairly inexpensive and was a way to include family and friends in a fun and casual way. Looking back, I don’t at all regret having a small, inexpensive wedding. So many people say that their wedding day went by like a blur with so much going on and hundreds of people to greet. I have wonderful memories of our wedding day. I love that we got to spend the day with our close family and that there was very little to worry about because it was all kept so simple. Frugal Dates for $20, $10, or FREE! ⇒ What are your tips for saving money on a wedding? I love this post! Great advice about the dress and veil. Instead of getting caught up in how things are usually done, you thought out of the box. Very smart! My husband and I did a small wedding as well, in fact, it was just us! We went to Hawaii for 2 weeks (all paid for with points) and got married there. We paid $2,000 (the package price at the resort for a beach wedding) and had a gorgeous wedding, gorgeous photos, flowers, etc. Because it was only us, it was so relaxing. I went and got my hair, makeup and nails done and read a book in the hotel until it was time to put on my dress. We were already at our honeymoon destination, so it was just perfect! My in-laws were kind enough to throw us a reception at a traditional banquet hall, which we had about a month after the wedding, my parents paid for our wedding cake . 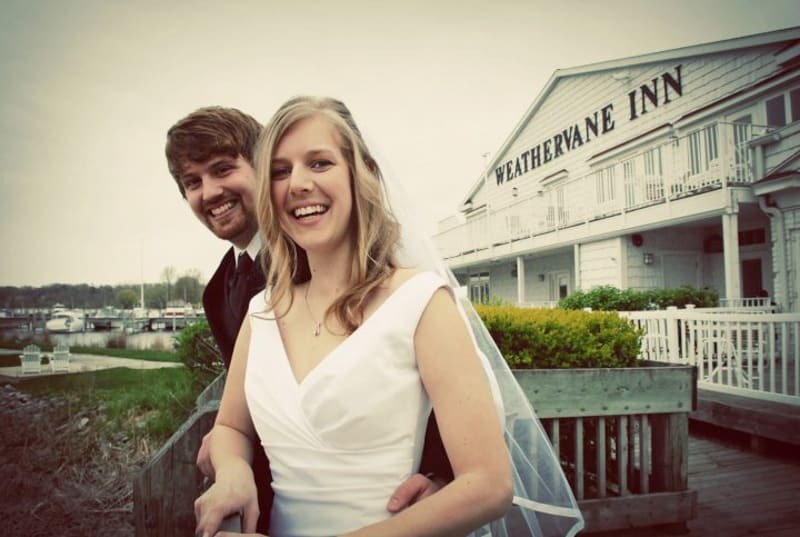 We too, played our wedding video on a loop so everyone could see it. We did have a large crowd at the reception, but I have a HUGE family and we had so much fun!! Regardless, we had no debt to pay off and looking back I wouldn’t change a thing. We’ve been married for 13 years now and together for 20. Your tips for keeping it small are spot on! It’s a blur, it’s busy, and it’s a lot of work. With me keeping it simple and cheap, I can recall every sweet memory and all of the beautiful details. There was no one to offend or tell me how I should do certain things. Plus, the joy of not paying off a wedding for years after is the best! I absolutely love this! Your wedding sounds perfect! ❤️ Thank you so much for sharing what you did.